Design Signs Online’s custom fundraising and goal thermometers are great for feedback about donations used, information about your progress or whether you’ve achieved your goals. When used appropriately, Design Signs Online’s goal thermometers are a quick and easy visual marker of where you stand. We have a wide selection of fundraising goal thermometer charts that are great for almost any application. 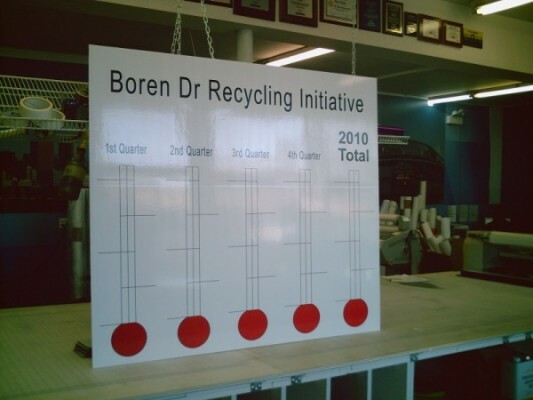 You can upgrade your goal thermometer with dry erase and have it mounted to PVC white board. Once you have completed your custom design just click on the upgrade that suits you specific needs.Â They are easy to use - just fill in the thermometer with dry erase markers as you move toward your goal. We also offer giant large goal thermometer banners that can be used outside.Â Our goal thermometers are perfect for your business, government agency, charity organization, school or church wants to monitor progress and achieve goals.